Simplified Substantia Nigra circuits. The dopaminergic projections to the striatum (red and blue arrows on the right) are lost in Parkinson’s disease. Parkinson’s disease is largely due to loss of dopaminergic neurons, most of which are found in the substantia nigra. Deficits are attributed to problems in the basal ganglia circuitry depicted on the figure to the right. The basal ganglia are involved in motor systems, particularly in learned, patterned motor movements. 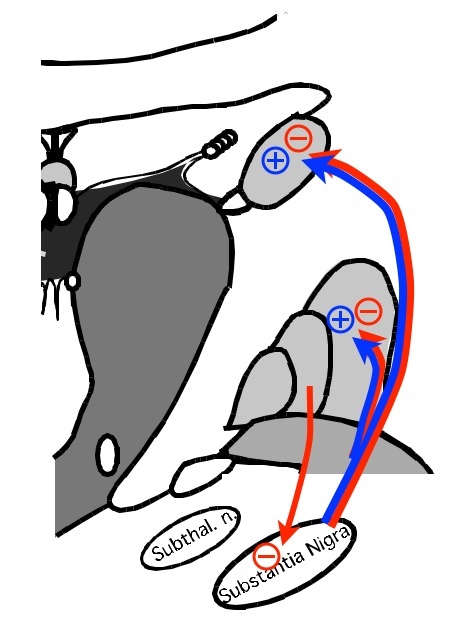 The basal ganglia form a “loop” that feeds back to motor cortex (basal ganglia loops not illustrated). Recent ideas emphasize the role of the basal ganglia in motor learning and suggest that the basal ganglia function by linking motor actions to internally generated rhythms. View the video below to see the remarkable dissociation of abilities in the patient. Walking and bike riding seem remarkably similar: both are complex, learned motor routines, that have become automatic, are rhythmic and involve a high degree of balance. Why the remarkable difference in function and dysfunction? The research team suggests that the rhythmic feedback from the pedals may be an important difference. Taking this one-step further, one may speculate that Parkinson’s disease is, in part, a deficit in supplying internally generated rhythms, and the pedals, or other external rhythms, may be an external aid. This may be similar to the therapeutic effects of dance or music (as in ipod therapy). I am not an expert on Parkinson’s disease or the motor systems. I’m curious about what others think. I especially invite comments suggesting mechanisms. This entry was posted in health and Disease, Neuroscience by jkubie. Bookmark the permalink. It might also be a function of the presence or absence of circuits in the cerebellum for the different functions (walking, dancing, biking). I’ve no idea how this would connect to neuroscience, but during my childhood torture via supposedly therapeutic bifocal glasses, I found cycling natural and relaxing, walking challenging and stressful, and running almost impossible. 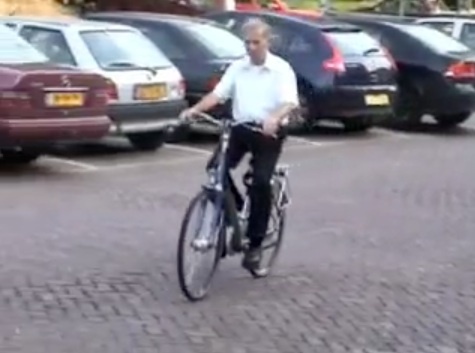 On a bike your perceived world moves smoothly past and your connection to the ground is remotely mediated and “adjustable”. When you’re walking, every step brings another moment when your foot must be placed on the ground in a new position – the flow of the world through peripheral vision stops as you attend to your body touching it, and then jerks backward as you push off toward the next step. When my feet seemed to be in a different visual space from most of the rest of the world this was exhausting. I’m trying to learn how other people see the movement of their environment as they walk through it, but nobody seems to have any words or even consciousness of the issues involved.